Budgies and many other small pet birds love to eat annual meadow grass. The scientific name of this grass is Poa annua. Served in an additional food dish, it will be a tasteful part of your pet bird's daily diet. The seeds are tiny what could cause some trouble. 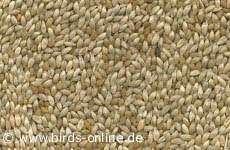 If the food dish is not deep enough, your birds will blow away the fine seeds while landing close to the dish because of the draught of their wings.